Your child is witness to the event that causes the Beast to take Beauty as prisoner and lock her into the highest tower of his castle. After hearing Beauty's cries of sadness, your child becomes a friend to her and helps her find true happiness. 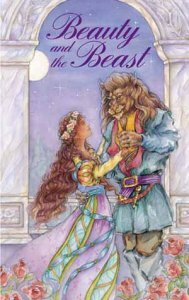 By teaching Beauty about kindness and compassion, her love with the Beast blossoms. This fairy tale classic is sure to bring a smile. One sunny day Caroline Kay Brown, age 7, was strolling through a park in San Antonio, Texas. Beautiful red roses were blooming around her. The roses reminded Carly of the story Heather and Hannah had once read to her. The story was about a handsome prince who was turned into an ugly Beast because he was so mean and selfish. While gazing at one rose, Carly instantly found herself inside a mysterious castle courtyard. From a distance, Carly could see Beauty pick a lovely rose blossom. Outraged by her ungratefulness, the Beast raised his giant claws and stomped away in anger. Carly remembered that Heather and Hannah had told her to be kind to others. So Carly suggested to Beauty to make friends with the Beast. In time Beauty and the Beast became very good friends. One day the Beast allowed Beauty to see her family through a magic mirror. Tears came to the eyes of the homesick Beauty. The Beast could not bear to see Beauty so unhappy and immediately sent her home on a mighty stallion. Beauty was very glad to be home again. Beauty left her home and raced toward the castle on the mighty stallion. All the forest animals watched, hoping Beauty would arrive in time to save the Beast. Beauty entered the castle gates and found the Beast lying limp and motionless in the garden.